For Identity server to be able to sign the login request you can add a Test certificate from the Identity Server it self or you are able to generate a certificate your self. To generate a certificate compatible for Identity Server your self you can perform the following command in a “Developer Command Prompt”. The command will generate a self signed certificate within your local computer certificate store. Once generated you can export the certificate including the private key with the MMC-snapin. Open a Command Prompt window, in Administration Mode. Type mmc and press the ENTER key. On the File menu, click Add/Remove Snap In. In the Add Standalone Snap-in dialog box, select Certificates. In the Certificates snap-in dialog box, select Computer account and click Next. In the Add Standalone Snap-in dialog box, click Ok. Within the Personal folder open the Certificates. Within that container you can see your certificate. As many of you may know the makecert application is deprecated. 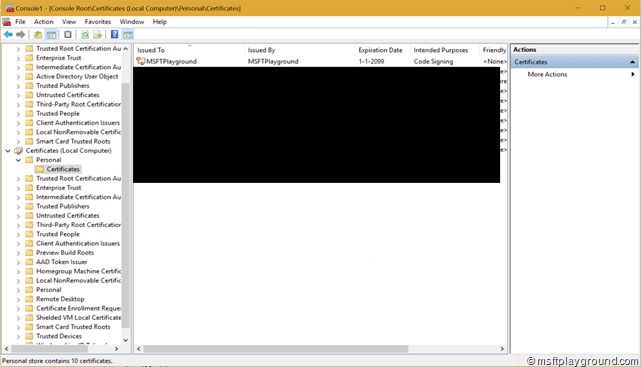 The new option to generate certificates is using PowerShell. With the method “New-SelfSignedCertificate” it is quite hard / pretty impossible to generate this kind of certificates. This will leaves you with implementing the following PowerShell script. Is there a way to do this with the powershell New-SelfSignedCertificate command? makecert.exe has been deprecated. If you have the correct syntax, that would be helpful! Will update the post with the powershell included!